The forecast path shown above is the Bureau’s best estimate of the cyclone’s future movement and intensity. There is always some uncertainty associated with tropical cyclone forecasting and the grey zone indicates the range of likely tracks of the cyclone centre. Due to the uncertainty in the future movement, the indicated winds will almost certainly extend to regions outside the rings on this map. The extent of the warning and watch zones reflects this. This product is designed for land-based communities; mariners should read the coastal waters and high seas warnings. 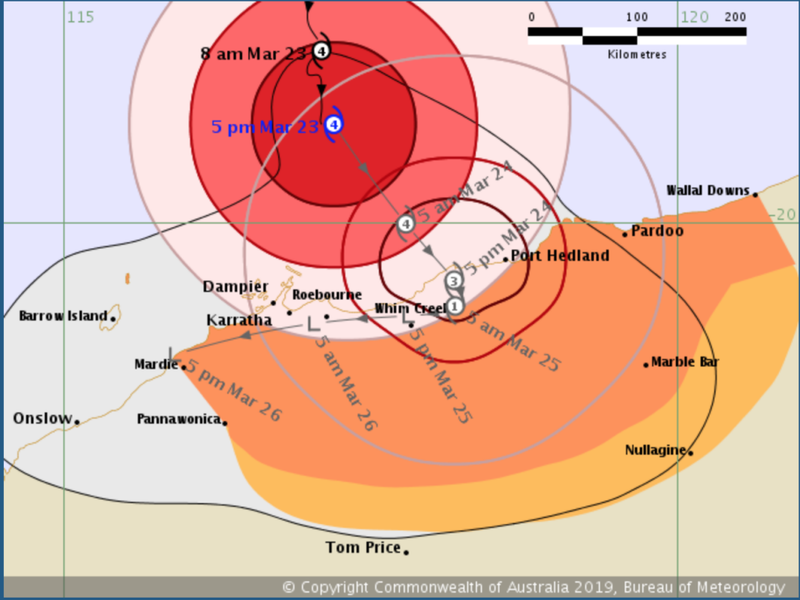 Severe tropical cyclone impact expected on the central Pilbara coast during Sunday. Destructive winds expected overnight along the Pilbara coast. Warning zone: Wallal to Mardie. Watch zone: extending to the inland Pilbara to include Pannawonica and Nullagine. Intensity: category 4, sustained winds near the centre of 165 kilometres per hour with wind gusts to 230 kilometres per hour. Location: within 30 kilometres of 19.2 degrees South, 117.2 degrees East , 175 kilometres north northeast of Karratha and 190 kilometres northwest of Port Hedland . Movement: south southeast at 8 kilometres per hour . Severe Tropical Cyclone Veronica, a Category 4 system, is slowly moving towards the Pilbara coast. A severe coastal impact is expected during Sunday with the very destructive winds near the centre of the cyclone likely to affect the coast from early Sunday morning. The system is expected to cross the coast during Sunday, somewhere between Pardoo and Roebourne. The crossing may occur close to Port Hedland. GALES with gusts to 100 kilometres per hour are starting to develop between Wallal Downs and Mardie, and are expected to extend inland to Marble Bar by Sunday morning. DESTRUCTIVE WINDS with gusts exceeding 125 kilometres per hour are forecast to develop along the coast between Pardoo and Mardie overnight Saturday, continuing during Sunday. VERY DESTRUCTIVE WINDS with gusts in excess of 165 kilometres per hour are expected near the cyclone centre as it approaches and crosses the coast during Sunday. On Sunday gales may extend to adjacent inland areas including Pannawonica and Nullagine. Veronica may be travelling more slowly than a typical system as it crosses the coast during Sunday, and as a result communities in the path of the cyclone should prepare to shelter from the destructive winds for an extended period of 12 hours or more. Widespread very heavy rainfall conducive to MAJOR FLOODING is likely over the Pilbara coast and adjacent inland areas over the weekend. Heavy rainfall is expected to result in significant river rises areas of flooding and hazardous road conditions. Some roads may become impassable and some communities may become isolated. A Flood Warning is current for the Pilbara Coastal Rivers, a Flood Watch is current for the Pilbara District Rivers. Please refer to the warning for further details (http://www.bom.gov.au/wa/warnings/). People along the Pilbara coast are warned of the potential for a VERY DANGEROUS STORM TIDE as the cyclone approaches the coast late Saturday. Tides are likely to rise significantly above the normal high tide mark with DAMAGING WAVES and VERY DANGEROUS COASTAL INUNDATION. RED ALERT: People in or near communities between Pardoo and Whim Creek, including Port Hedland and South Hedland, but excluding Marble Bar, need to go to shelter immediately. YELLOW ALERT: People in or near remaining communities between Wallal and Mardie, including Point Samson, Wickham, Roebourne, Karratha, Dampier and inland to Marble Bar need to take action and get ready to shelter from a cyclone. BLUE ALERT: People in or near communities for parts of the inland Pilbara including Pannawonica and Nullagine need to prepare for cyclonic weather and organise an emergency kit including first aid kit, torch, portable radio, spare batteries, food and water.